This is the original blanket made for Katie. The quilt contains many of her mother's special garments, it was backed in a classic tan minkie. The quilt is so soft! A total of 4 blankets were made for this family. 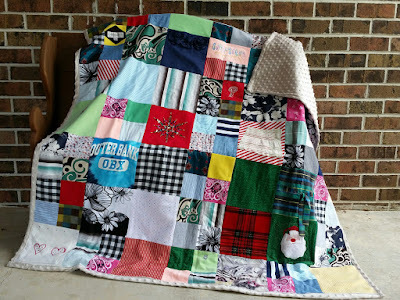 The customer requested that these 4 blankets not be long arm quilted. I originally was skeptical, but I think they turned out just beautiful! 3 super snugly blankets were made for Katie's 3 very young children with their grand mother's favorite scarves, soft fleece vests, and even a fancy dress. These blankets were backed with super soft minkie to add to their snug-ability ;) The child's name was embroidered on each.